What does the 2019 Edelman Trust Barometer mean for sales enablement? The challenge and objective in sales is to build a trusted relationship with the buyer early enough that you position yourself as the go-to solution. In order to do this, you typically need to demonstrate a level of expertise that relates to the challenges of the buyer and also shows that you understand their needs. The 2019 Edelman Trust Barometer (link below) was released last Friday and it demonstrates a few important results to consider in relation to the above. Once again "Company Technical Experts" are the most credible source of information - up 2% on last year. 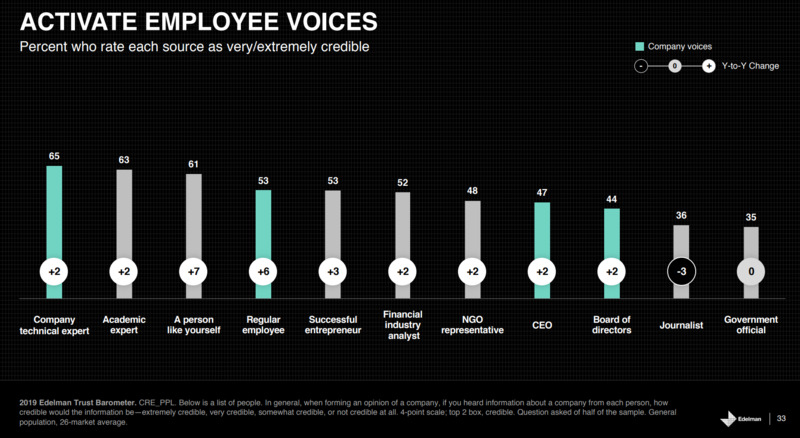 65% consider them "Very or Extremely Credible!" 65% of people consider Company Technical Experts as "Very or Extremely credible". Also both "A person like yourself" - peers on LinkedIn, for example - and "Regular Employee" made strong gains. If you are in Sales then you should be looking to leverage the insights of your 'company technical experts' and, if you are in sales enablement or marketing, you really should be creating a process whereby your sales team can leverage the insights of your technical experts. As Corporate Visions shows, 74% of buyers choose the sales rep that was first to add value and insight. Creating a process to enable your experts to get to market in the most relevant manner must be a priority for sales enablement and marketing this year.